There was another issue that came up in the P.U.P.’s press briefing earlier today. 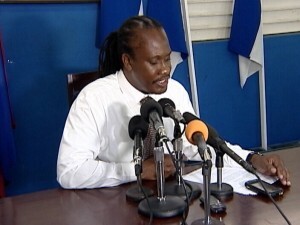 It involves the Elvin Penner recall petition put in motion by the Party, but rejected on December thirty-first by the Elections and Boundaries Office. The rejection came on the basis that it did not meet the threshold of valid signatures. The P.U.P. has indicated that it will seek judicial review of that decision. Legal Advisor, Anthony Sylvestre, says that one thing has nothing to do with the other, and this recent legal hit against Penner is a totally separate matter. Anthony Sylvestre, Legal Advisor, P.U.P. The petition failed to meet the threshold by seventy-nine signatures, after the Elections and Boundaries Office disqualified those persons whose signatures, though valid, were found to be duplicated. D.P.P. says she is investigating firearm case of Reynaldo Verde?